Mixcloud is very popular online radio and podcast destination that managed to revolutionize the way we consume audio content by connecting the dots between radio shows, podcast, DJ mixes and audience. With Mixcloud you can become part of a network of audio listeners, no matter if you want to consume or to produce audio content. Mixcloud is here to give you ways to find new popular Cloudcasts, find best recommendations and engage in discussion with other people. If you want to produce your own show, podcast or music, Mixcloud has a complete online infrastructure ready and waiting. In no time you can upload your show to the internet, promote it to millions of listeners and start your marketing campaign by offering your own custom audio widgets that can be embedded into any site. Amazing online radio and podcast! Even though there are seemingly countless music streaming services, music hosting services where you can upload or manage online catalogues of your entire music catalogue, and some are focused on radio streaming which is sometimes basic and sometimes with songs that are carefully picked to fit your tastes. However, sometimes all that you need is basic stuff – place to upload your songs, promote them, and build community interactions around your profile, around songs that you like and songs or audio content of other people. This is exactly what Mixcloud offers, basic set of features that are crafted to be as intuitive and as useful as possible. Everyone can experience content on the site freely, without restrictions, and can engage community and start uploading only after they have created their free account. No matter what kind of audio content you are seeking, you will find it here, from best music, podcasts, radio shows, DJ mixes, to the special shows with some of the world’s most influential celebrities, for example American president Barrack Obama, numerous TED speakers, famous business executives and more. 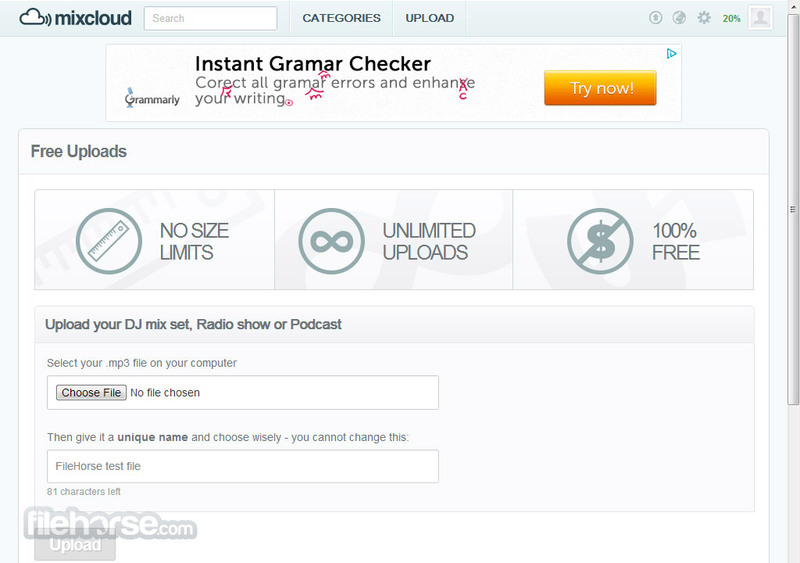 Mixcloud is very popular music hosting and sharing service that allows users from all over the world to freely browse and listen music and audio files that are uploaded to their serves, and gives uploaders the chance to make Mixcloud home for their music library, music songs they have created, podcast, audio shows, and other audio content. This simple approach to music streaming has allowed Mixcloud to very quickly become highly regarded among world media, with community that consists not only from ordinary users but also from highly skilled professionals from many fields, including music industry, technology, economy, politics and marketing. This kind of attention has elevated Mixcloud far above many other music sharing sites that have integrated social networking capability, which helped original founders of the site to regain ownership over it and dictate themselves the rate of expansion of its various features. Great online radio and podcast! 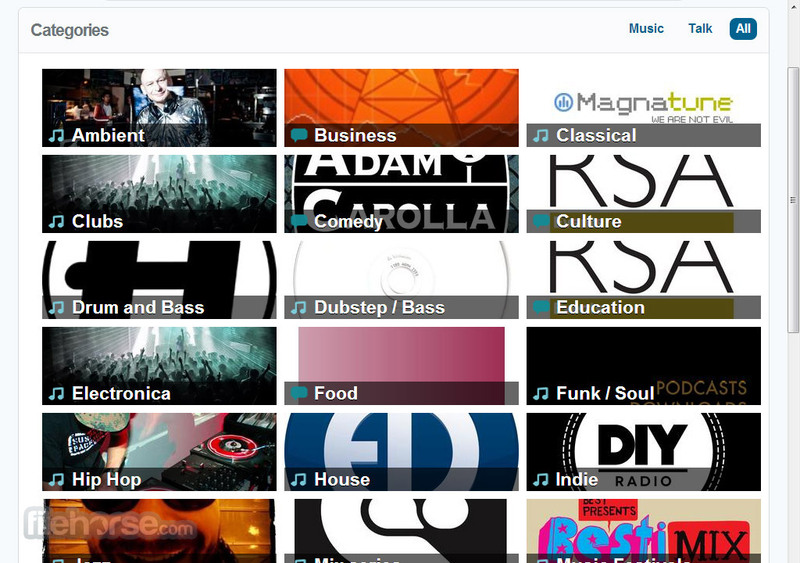 After 5 years on the market, Mixcloud managed to gain a nickname of “YouTube of Music”, which perfectly describes what experiences and tools you can get when you arrive on this great community. 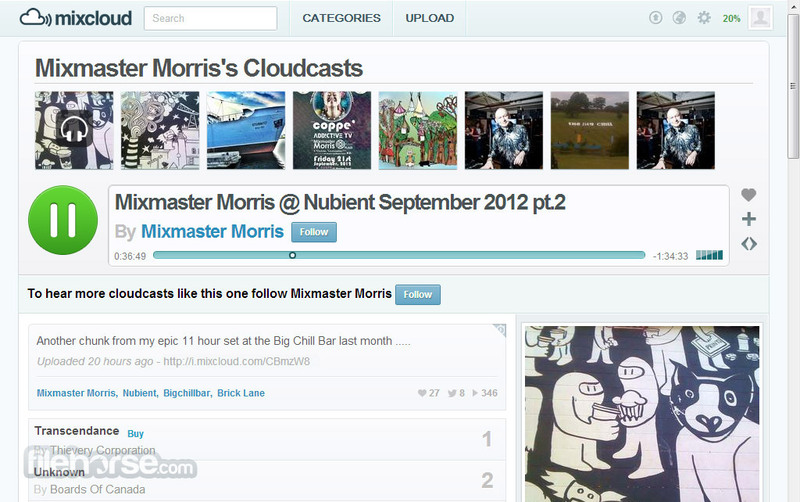 You can easily search for cloudcasts of its entire user base, manage your subscriptions, upload content, engage in conversation, share your tastes across many popular social networks, and make Mixcloud home of your musical career (especially now when users have gained ability to upload unlimited amount of audio content on their cloud storage profiles). 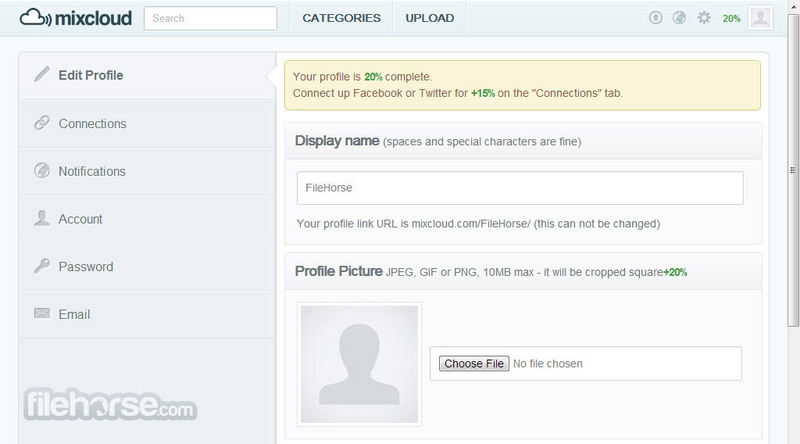 Mixcoud is available on PC via its great web interface, and dedicated client applications for Android and iOS. From the moment you arrive on Mixcloud you will notice that it doesn’t have standard interface that is often present in modern music streaming applications. Top features simple navigation tab for searching, finding categories, and user profile options, and the remainder of the page is dedicated to the currently popular cloudcast pulled from the all categories the site offers. This approach and its visual design is not so modern like we would like it to be, but it gets the job done. Pages in which you can start listening songs have much better design, clearly made to offer great scalability when they are shown on portable devices with smaller display sizes. 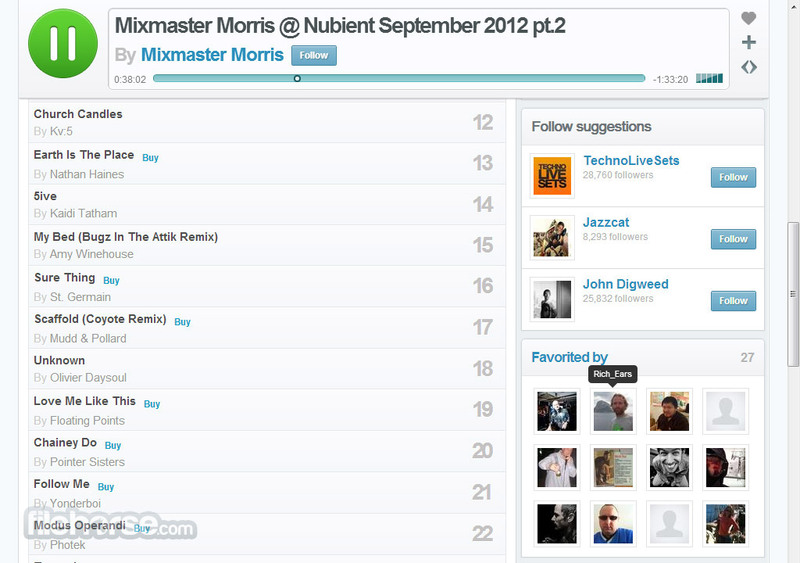 Mixcloud is free, with very simple process for creating new account (email or Facebook login). Mixcloud is a great music sharing and streaming service that is perfect for creators,listeners, music discovery and talk shows. We fully recommend it to at least try it and see for yourself if it fits your needs. Amazing online radio and podcast!